Since my early teens in the late 1960s, I have been a fan of Simon & Garfunkel. Until last week I had a number of their albums in well worn condition as well as the boxed set of CDs containing everything they ever did. It was therefore a great delight, while browsing my local record store, Relevant Record Cafe, in Mill Road, Cambridge, I chanced upon this new release. The albums are on super quiet 180gm vinyl and the quality of the packaging and printing is first rate. You feel proud to own this boxed set as it is so nicely presented. Now to the music, as I have already said the pressing quality is as good as anything I have heard, the vinyl is so quiet and pop free. The recordings have all been remastered from the first generation analogue master tape and it shows. There is a big, spacious sound stage with the duo to the left and right. The result of all this effort is 6 wonderful albums that take me back in time to the hay-day of records, with Simon and Garfunkel at their peak. If vinyl had always been produced to this standard no one would have accepted CDs. 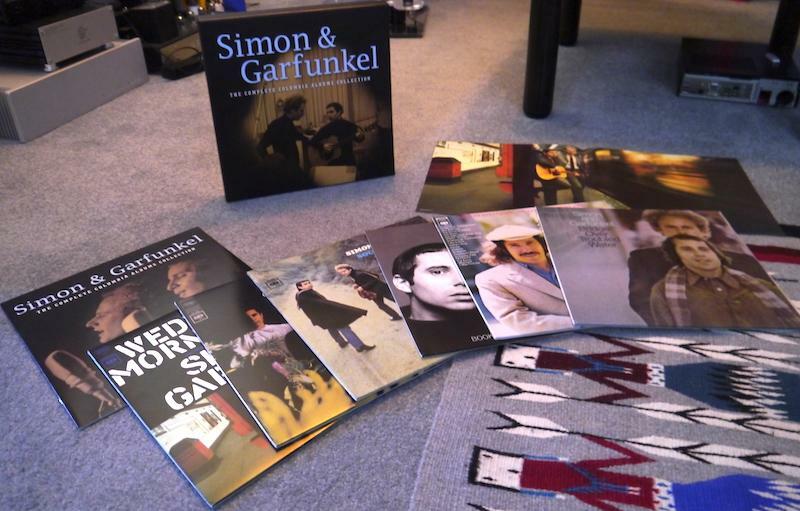 If you are a fan of Simon & Garfunkel you owe it to yourself to track this boxed set down, I know Amazon have a couple in stock in the UK! I will spend hours savouring the music whilst flicking through the booklet and those atmospheric pictures. I can easily read the booklet as it is a good size, unlike those supplied with some CDs.